Formation of pitch and sticky deposits through the destabilisation of colloidal material present in paper manufacture continues to be a challenge in improving machine efficiency in newsprint manufacture from a furnish comprising thermo-mechanical pulp (TMP) and recycled fibre (RCF), and in an environment where water usage efficiency is at best practice. 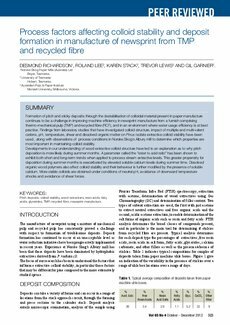 Findings from laboratory studies that have investigated colloid structure, impact of multiple and multi-valent cations, pH, temperature, shear and dissolved organic matter on Pinus radiata extractive colloid stability have been used , along with observations of process conditions in Norske Skog’s Albury mill to determine which properties are most important in maintaining colloid stability. Developments in our understanding of wood extractive colloid structure have led to an explanation as to why pitch deposition is more likely during summer months. A parameter called the "ester to acid ratio" has been shown to exhibit both short and long-term trends when applied to process stream extractive levels. This greater propensity for deposition during summer months is exacerbated by elevated soluble calcium levels during summer time. Dissolved organic wood polymers also affect colloid stability and their behaviour is further modified by the presence of soluble calcium. More stable colloids are obtained under conditions of neutral pH, avoidance of downward temperature shocks and avoidance of shear forces.